Here is a new tutorial that will include “a bit of all” tutorials previously published on this blog and some new cool stuff to play with ! I found some statistics about the preferred period for holidays in the EU, per country (here). On Page 4, you’ll see a table (Table 2) that summarize the number of Tourism Nights spent away by EU residents in 2009, broken down by quaters (right part of the table). The country codes are ISO-like codes, we’ll have to handle that later ! I also needed a file to convert the ISO code to “English Name”, I found the necessary resource on the iso.org website. I saved the file in the same folder. I use a new numpy method, called “loadtxt”, which is super easy to work with ! The data array contains the full table. One can assign the column/row numbers like in any numpy array, or use the field names. It’s important to define dtypes when you have string-type data in a file. Note, here, we set the “skiprows=2” and “delimiter=;” so the method knows where to start reading, and how to split the lines. Step 2: Parse data, get the coordinates and plot ! With this data, we will plot a pie charts of the data, centered on the coordinates. country = country.replace(' ','%2F') #needed for GoogleMaps API to recognize the "space"
time.sleep(0.4) #Needed because I did not provide my GoogleMaps API key ! The iso code for Greece and Great Britain are not properly set in the EU-data file, so we need to correct them before masking the ISO-array to recover the country name. Once we have the country name, we can ask GoogleMaps API to give us the coordinates. Here, I do not use the free API key google provides, and I have to set a time.sleep(0.4) (seconds) between two requests, otherwise my requests get trashed. Using urrlib2, we can ask Google, and read the result of the location. 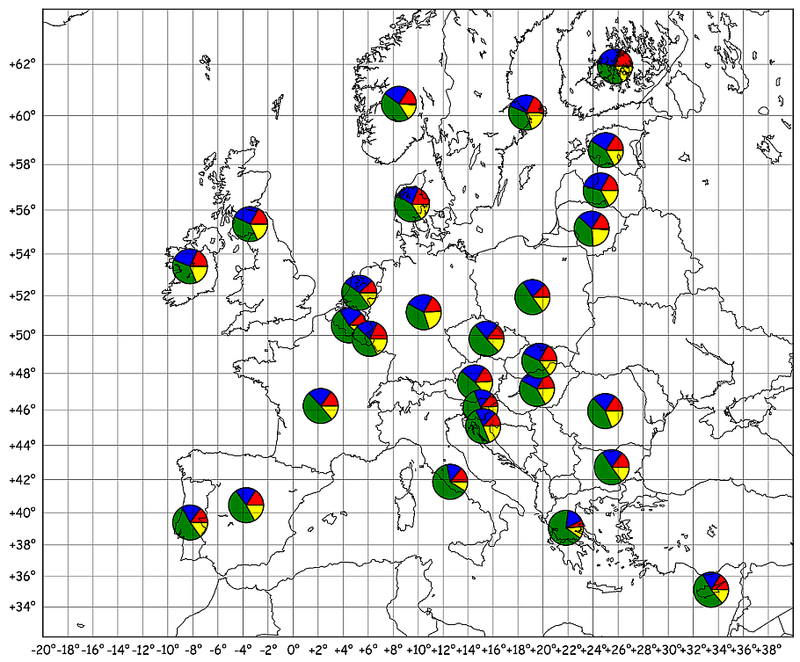 Finally, we project the (lon, lat) to (X,Y) and plot the pie chart, and… It’s done !! Most EU residents tend to go on vacation on Q3 !! See the full code after the break ! 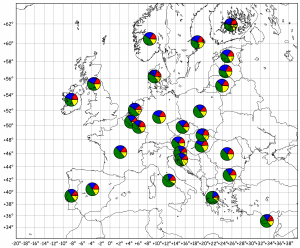 ← Matplotlib Basemap tutorial 05 : Adding some pie charts !